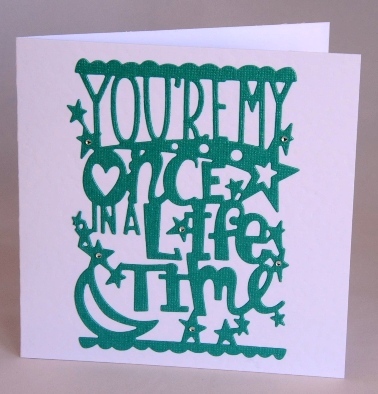 I have die cut this design from a beautiful blue-green card which has a delicate sheen to it. The words read “You’re my once in a lifetime”. The stars are embellished with tiny clear acrylic gemstones and the card is blank inside for your own loving message. If ordering by phone, please reference card #771.